This week's creative space is all about getting creative spaces ready for other people. In the background you can see an array of stunning limited-edition, hand screen-printed Pippijoe prints. They are destined for the "Handmade Shower Cap" craft lab which I am running next week at at the Melbourne Stitches and Craft Show 2010. As I prepare the patterns, fabric and notions I am feeling equal parts of nerves and excitement. 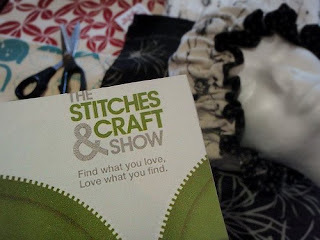 So, are you going to the Stitches and Craft Show? Its open daily between 5 - 9 May at the Caulfield Racecourse. It will be heaps of fun and entry is only $10 (can you believe a two day pass is just $15?). So much to do - pop along to craft labs and studios, make stuff, learn stuff, meet people, be inspired ... and of course stock up on your craft supplies! The full show guide can be found here. And I had better not forget a bit of shameless self promotion! If you fancy sitting down for an hour and making a shower cap for yourself - or maybe as a gift for Mother's Day - do come along to my craft lab. (See for yourself whether I really am a blue hippo in red overalls!). Full booking details (along with dates and times) can be found here. I'm going to be working at the show for a couple of days so I will see you there. I'm excited for you. what do you mean you are NOT a hippo in red overalls!!! goodluck with it all Liesl, will definitely see you there. good luck, I wish I could be dropping in to meet everyone but I don't think it is meant to be. yes yes I am coming - Thursday - yay! Good luck with your show - I was reading the guide then went OMG OMG OMG that is Liesl! Oh hooray for you Liesl. I hope you have a fabulous time at the show. Sounds like a great show, if I can wangle the time to go, I will definatley say hi! Cool, will see you there!